Dreadfully sad news for the Walrus. 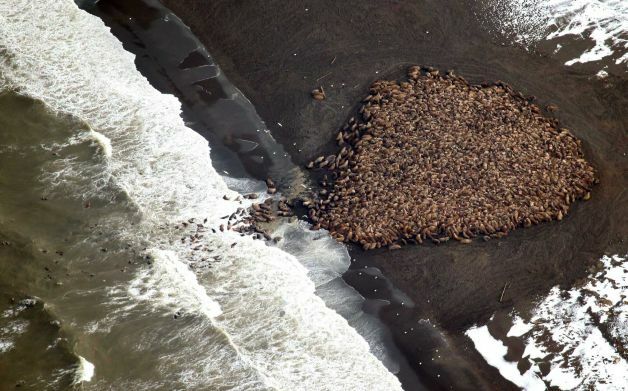 ANCHORAGE, Alaska (AP) — Pacific walrus that can’t find sea ice for resting in Arctic waters are coming ashore in record numbers on a beach in northwest Alaska. Funnily enough this strange new behaviour, hauling out on land, has been noted before. The walrus was virtually unknown to Europeans until 1604 when the good ship “Speed”, commanded by Stephen Bennet, on its way back from the Kola Peninsula, came across a haulout of Walrus. Naturally they slaughtered a goodly number for their tusks, leaving the meat to rot on the beach. The Walrus Islands State Game Sanctuary (WISGS), protects a group of seven small craggy islands and their adjacent waters in northern Bristol Bay, approximately 65 miles southwest of Dillingham. The WISGS includes Round Island, Summit Island, Crooked Island, High Island, Black Rock and The Twins. The WISGS was established in 1960 to protect one of the largest terrestrial haulout sites in North America for Pacific walrus (Odobenus rosmarus divergens). The sanctuary also protects important habitats for several species of seabirds, Steller sea lions (Eumetopias jubatus) and other marine and terrestrial birds and mammals. The Alaska Department of Fish and Game (ADF&G) manages the sanctuary primarily to protect these important habitats and wildlife species, and secondarily to provide for public use and enjoyment of these resources including the opportunity for scientific and educational study, viewing, and photography. You can read Lewis Carroll’s poem <HERE>.